​​​​​​ ROUND ROCK – Nutty Brown Amphitheater is readying to adopt Round Rock as its new home. Round Rock approved the sale of the 18.4-acre McNeil Park, site of the future music venue, to the owner of Nutty Brown Amphitheater for $1.1 million in Aug. 2015 (this is not a typo). 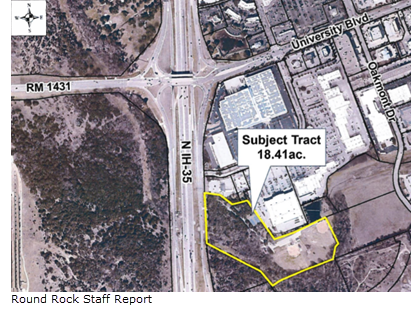 ​The project is close to the southeast intersection of I-35 and University Blvd., just south of the University Oaks Shopping Center. ​Check out Austin Retail Market Research.